The exhibition Longing at Studiolo Berlin brings together the work of Italian photographer Daniele Ansidei and Los Angeles based industrial designer Jonathan Olivares. Curated by Benjamin Merten, the exhibition critically enquires through the medium of photography and industrial design one of the most persistent human experiences: the sensation of longing – the longing for the other, the unknown, the exotic. Ansidei’s austere series of works depicts exotic animals in often bizarre architectural situations and industrial landscapes in a region of Northern Italy which also served as scenery for Michelangelo Antonioni’s film Deserto Rosso. Here, Ansidei’s photographic focus is clearly placed on the discrepancy between the characteristic landscape and the subjects of the images. Equally peculiar in appearance is his associated second series of works which displays almost topographical close-ups of taxidermy animals. 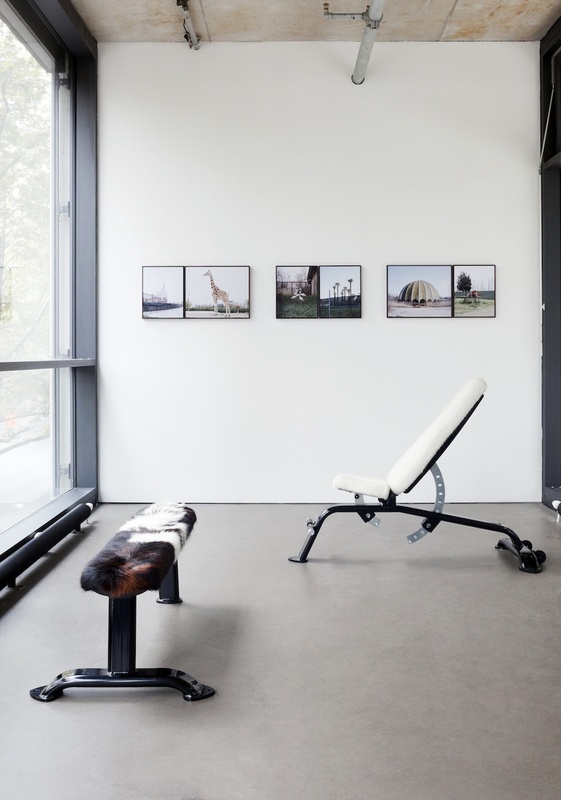 In his exhibition design for Ansidei, Olivares picks up this notion of estrangement and alienation by re-upholstering massive athletic gym benches with animal hides, that relate to the animal bodies and the unused architectural landscapes in Ansidei’s photography: „I have always considered furniture design—in its materials and construction—to be athletic in nature and Ansidei's photos expand my sense of athleticism with notions of physical decay“.